First, I am not an attorney. Second, I am not giving legal advice. What I am doing is giving you suggestions on what you should discuss with your estate attorney. If you are reading this article, you most likely already know what a revocable living trust is, so I don’t need to mention anything regarding these trusts. Plus much of the information on living trusts can be found on numerous websites. Many people save their estate paperwork in their safe deposit boxes, including wills, trusts, powers of attorney, and so forth. Other items may be in the boxes such as jewelry, coins, stamps, gold, silver, collectibles, and cash. One issue you should be aware of. Apparently, banks have started drilling boxes and removing contents of boxes rented by customers without the customer’s knowledge, for which the banks claim that they din’t have all the account information of their customers (primarily the Social Security number). However, according to a report by CBS SF Bay Area last year, several of these customers had proof, as shown on the original rental agreements, that the bank did have the Social Security numbers. Clients claimed that the banks lost and damaged many thousand of dollars of property because of this. It may be a good idea to inventory everything in your safe box, and even take pictures of what is in in, and keep those records outside the box. 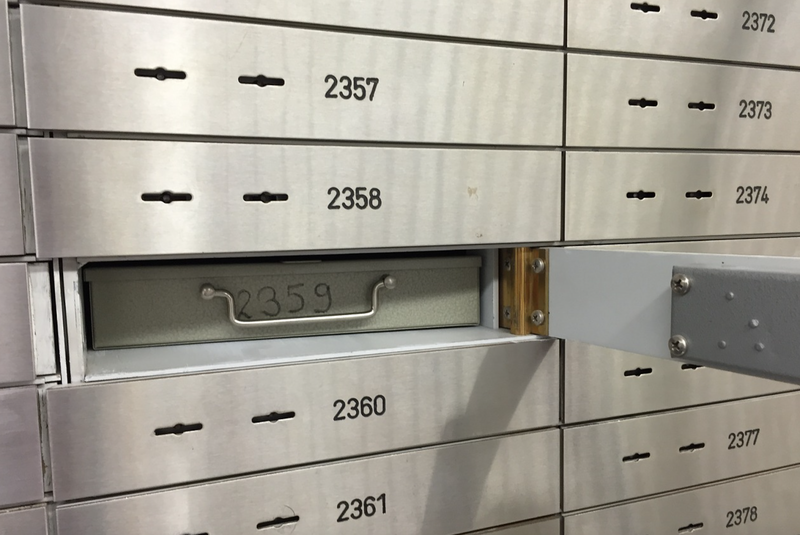 Can and Should You Put Your Safe Deposit Box Rental in Your Living Trust? So what about the living trust issue? If everything in the safe deposit box is supposed to be part of the trust, it is probably a good idea to rent the safe deposit box in the name of your living trust. Consult your attorney, as laws differ from state to state. As a matter fo fact, the American Academy of Estate Planning Attorneys recommends to their members that they discuss with their clients the benefits of transferring the rental of a safe deposit box to a living trust. Your biggest problem in doing this is whether or not your bank will allow you to do this, as some banks don’t want to go through the hassle. You will, of course, need to bring in your Certification of Trust to make the change. If your bank doesn’t want to allow this rental registration, you can ask your attorney to contact the bank on your behalf, or find another bank. As I mentioned at the beginning of this article, I want to reemphasize the fact that you must talk to your attorney about the advantages and disadvantages of making this change, and the best way to proceed with the bank. Your attorney may even have alternative banks that he or she could recommend, if your bank is problematic. Special Note: If you are wondering how I came up with the idea for this article, there was a short scene in the Bosch TV Show on Amazon (AMZN) that referred to it which I saw when I was watching one of the episodes last night.